Vaccines or chemoprophylactic drugs are available to protect against some vectorborne diseases such as yellow fever, Japanese encephalitis, and malaria; however, travel health practitioners should advise travelers to use repellents and other general protective measures against biting arthropods. The effectiveness of malaria chemoprophylaxis is variable, depending on patterns of drug resistance, bioavailability, and compliance with medication, and no similar preventive measures exist for other mosquitoborne diseases such as dengue, chikungunya, Zika, and West Nile encephalitis or tickborne diseases such as Lyme borreliosis, tickborne encephalitis, and relapsing fever. Be aware of peak exposure times and places. Exposure to arthropod bites may be reduced if travelers modify their patterns or locations of activity. Although mosquitoes may bite at any time of day, peak biting activity for vectors of some diseases (such as dengue and chikungunya) is during daylight hours. Vectors of other diseases (such as malaria) are most active in twilight periods (dawn and dusk) or in the evening after dark. Avoiding the outdoors or taking preventive actions (such as using repellent) during peak biting hours may reduce risk. Place also matters; ticks and chiggers are often found in grasses, woodlands, or other vegetated areas. Local health officials or guides may be able to point out areas with increased arthropod activity. Optimum protection can be provided by applying the repellents described in the following sections to clothing and to exposed skin (Box 2-03). Dengue, yellow fever, and chikungunya vector mosquitoes bite mainly from dawn to dusk. DEET (chemical name: N,N-diethyl-m-tolua-mide or N,N-diethyl-3-methyl-benzamide). Products containing DEET include, but are not limited to, Off!, Cutter, Sawyer, and Ultrathon. Picaridin (KBR 3023 [Bayrepel] and icaridin outside the United States; chemical name: 2-(2-hydroxyethyl)-1-piperidinecarboxylic acid 1-methylpropyl ester). Products containing picaridin include, but are not limited to, Cutter Advanced, Skin So Soft Bug Guard Plus, and Autan (outside the United States). Oil of lemon eucalyptus (OLE) or PMD (chemical name: para-menthane-3,8-diol), the synthesized version of OLE. Products containing OLE and PMD include, but are not limited to, Repel and Off! Botanicals. This recommendation refers to EPA-registered repellent products containing the active ingredient OLE (or PMD). “Pure” oil of lemon eucalyptus (essential oil not formulated as a repellent) is not recommended; it has not undergone similar, validated testing for safety and efficacy, is not registered with EPA as an insect repellent, and is not covered by this recommendation. IR3535 (chemical name: 3-[N-butyl-N-acetyl]-aminopropionic acid, ethyl ester). Products containing IR3535 include, but are not limited to, Skin So Soft Bug Guard Plus Expedition and SkinSmart. EPA characterizes the active ingredients DEET and picaridin as “conventional repellents” and OLE, PMD, and IR3535 as “biopesticide repellents,” which are either derived from or are synthetic versions of natural materials. The Environmental Protection Agency (EPA) allows companies to apply for permission to include a new repellency awareness graphic on the labels of insect repellents that are applied to the skin (Figure 2-01(http://wwwnc.cdc.gov/travel/yellowbook/2016/the-pre-travel-consultation/protection-against-mosquitoes-ticks-other-arthropods#4550)). 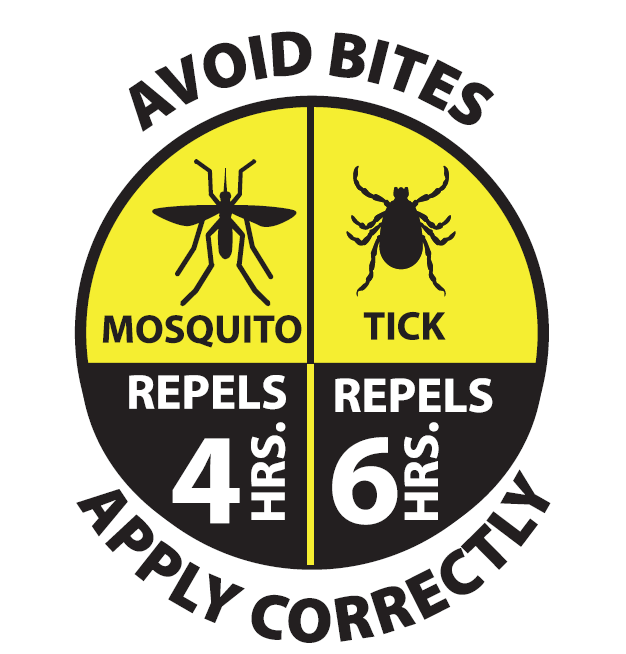 The graphic helps consumers easily identify the time a repellent is effective against mosquitoes and ticks. EPA reviews products that apply to use the graphic to ensure that their data meet current testing protocols and standard evaluation practices. Use of this graphic by manufacturers is voluntary. For more information, visit www2.epa.gov/insect-repellents/repellency-awareness-graphic. Permethrin is a highly effective insecticide-acaricide and repellent. Permethrin-treated clothing repels and kills ticks, chiggers, mosquitoes, and other biting and nuisance arthropods. Clothing and other items must be treated 24–48 hours in advance of travel to allow them to dry. As with all pesticides, follow the label instructions when using permethrin clothing treatments. There has been a recent resurgence in bedbug infestations worldwide, particularly in developed countries. Although bedbugs do not transmit diseases, their bites may be a nuisance. Travelers can take measures to avoid bedbug bites and avoid transporting them in luggage and clothing (Box 2-04). A recent resurgence in bedbug infestations worldwide, particularly in developed countries, is thought to be related to the increase in international travel, pest control strategy changes in travel lodgings, and insecticide resistance. Bedbug infestations have been increasingly reported in hotels, theaters, and any locations where people congregate, even in the workplace, dormitories, and schools. Bedbugs may be transported in luggage and on clothing. Transport of personal belongings in contaminated transport vehicles is another means of spread of these insects. Bedbugs are small, flat insects that are reddish-brown in color, wingless, and range from 1 to 7 mm in length. Although bedbugs have not been shown to transmit disease, their bites can produce strong allergic reactions and considerable emotional stress. Inspect the premises of hotels or other sleeping locations for bedbugs on mattresses, box springs, bedding, and furniture, particularly built-in furniture with the bed, desk, and closets as a continuous structural unit. Travelers who observe evidence of bedbug activity—whether it be the bugs themselves or physical signs such as blood-spotting on linens—should seek alternative lodging. Keep in mind that bedbug eggs and nymphs are very small and can be easily overlooked. Barnard DR, Xue RD. Laboratory evaluation of mosquito repellents against Aedes albopictus, Culex nigripalpus, and Ochlerotatus triseriatus (Diptera: Culicidae). J Med Entomol. 2004 Jul;41(4):726–30. Fradin MS, Day JF. Comparative efficacy of insect repellents against mosquito bites. N Engl J Med. 2002 Jul 4;347(1):13–8. Goodyer LI, Croft AM, Frances SP, Hill N, Moore SJ, Onyango SP, et al. Expert review of the evidence base for arthropod bite avoidance. J Travel Med. 2010 May–Jun;17(3):182–92. Lupi E, Hatz C, Schlagenhauf P. The efficacy of repellents against Aedes, Anopheles, Culex and Ixodes—a literature review. Travel Med Infect Dis. 2013 Nov–Dec;11(6):374–411. Murphy ME, Montemarano AD, Debboun M, Gupta R. The effect of sunscreen on the efficacy of insect repellent: a clinical trial. J Am Acad Dermatol. 2000 Aug;43(2 Pt 1):219–22. Pages F, Dautel H, Duvallet G, Kahl O, de Gentile L, Boulanger N. Tick repellents for human use: prevention of tick bites and tick-borne diseases. Vector Borne Zoonotic Dis. 2014 Feb;14(2):85–93.